Some clients will immediately think of something, and respond quickly, often before they nod. Others may take a little longer as they go through a brief search process before deciding on something and nodding. You want to notice what’s different compared to their state before you gave them the instruction, and the speed of their response is useful information. If you want to be more covert, you can say, “So your name is Fred Freed, is that right?” and notice his response. If you don’t notice anything, you can ask about something else that you’re pretty sure he’ll agree with, until you do detect the nonverbal response. Clients are likely to be aware of smiles, nods, frowns, and other facial expressions with commonly accepted meanings. Since these can be faked, they aren’t reliable indicators of unconscious signaling. Clients are much less likely to be aware of small shifts in breathing, posture, head position, and so forth, so these indicators are much more reliable. Many responses to positive states can be categorized as parasympathetic: relaxation, movement, leaning forward slightly, pinker skin color, slower breathing and heart rate. Other responses will be individual to the client, and may include slight head tilts or movements, change in direction of the gaze, and small movements of fingers or hands. Then you can say, “Thanks, now think of something that you completely disagree with. Again it doesn’t matter what it is, and don’t tell me what it is, just nod when you’ve thought of something.” The contrast between the response to this and the previous instruction will highlight what was different in the responses. Many responses to negative states can be categorized as sympathetic ones: tension, stillness, moving backward slightly, whiter skin color, faster breathing and heart rate. But many other shifts will be individual to a particular client. One client showed a slightly open mouth in agreement, but a closed one in disagreement; another looked up for agreement and down for disagreement. You can do many other things to increase your sensitivity, all of which involve shifting your attention. Many therapists need to pay more attention to the nonverbal expressive music of the clients’ voices, rather than the content of what they’re saying. If a therapist looks aside while clients are talking, it can be easier to notice tonal and tempo shifts. But if a therapist looks down while they’re talking, and then looks up only as they finish, most of the nonverbal responses have already occurred, and are thus impossible to notice. It’s easier to detect your clients’ subtle nonverbal changes in position and movement with your peripheral vision than with central vision. This is why soft defocusing and becoming more aware of peripheral vision is taught in all the Asian martial arts. If you’re seated opposite your client, as most therapists are taught, most of the client’s body will not be in your peripheral field of vision. If you sit next to your client at a 45-degree angle, so that you’re facing in more or less the same direction—as Fritz Perls and Virginia Satir did—most of your client’s body will be in your peripheral vision, automatically increasing your sensitivity. There are many other advantages to sitting next to clients, often involving your nonverbal signals and their impact on clients. Facing more or less in the same direction has nonverbal implications of alliance and support, working together toward a joint outcome—in contrast to sitting opposite, which has implications of opposition or confrontation. When clients remember the past, or think about the future, they often look at images that are directly in front of them. If you’re sitting in front of them, you may be in the same location as these images, which can be confusing. Assuming that you’re facing in much the same direction, would you put the client’s chair on your left side or your right? In most right-handed people, the right brain is more sensitive to nonverbal emotional expression. Since the right brain receives visual information from the left visual field, you’ll automatically be much more sensitive to the signals of your clients’ emotional states when they’re sitting to your left. The right brain detects threat faster, so if you’re working with potentially angry or dangerous clients, that’s another reason to seat them on your left. Sitting next to clients makes it easy to touch them spontaneously and naturally with your left hand, without leaning forward awkwardly or leaving your chair. Although many therapists are still taught that any touch is inappropriate or even unethical, it’s an effective nonverbal way to elicit responses. Satir, one of the greatest therapists who ever lived, said: “If I couldn’t have the energy that comes out with touch, I’m certain that I could not have the kind of really good results that I have.” If you’re sitting opposite clients, or behind a desk, it’s much more difficult to express this kind of simple human connection. Experiments have found that when a sales or service person touches customers lightly and momentarily on the upper arm (one second or less), it substantially increases the purchases customers make in a store, the tips they give to waiters and waitresses, the evaluations of their shopping or dining experience, and the likelihood that they’ll return. A simple touch or two can work wonders for your relationship with your clients. 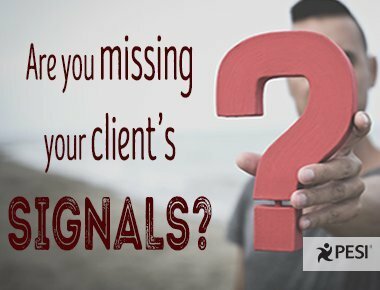 If a client responds aversively to a touch, it could mean that your touch was awkward or incongruent, or that the client has significant issues with touch, or many other possibilities—all important to know about and address. Like most people, many therapists shackle themselves by worrying about how a client might respond, rather than trying something and finding out how it works. You can always apologize, and any response can be utilized. These are just a few aspects of the nonverbal interactions that you have with your clients—something usually far more important than the words you exchange or the content being discussed. There are many, many ways to become aware of how you interact with a client, and what turns the interactions into a dance or a wrestling match. Continuing to discover and explore these choices can make your work ever more sensitive, subtle, and effortless, as well as more interesting and enjoyable. Share with us what tactics you've used to elicit verbal and non-verbal responses in the comments below. Editor's Note: This post was published July 26, 2018 on Psychotherapy Networker originally from "Therapy's Nonverbal Dance" by Steve Andreas.